Ever since I left London three years ago, I've tried to go back once a year to revisit old memories in my favorite city in the world. Yes, even after having lived in New York, London is still my number one. There's just something about that old British charm which you feel in everything you do and see in London. It's hard to beat. 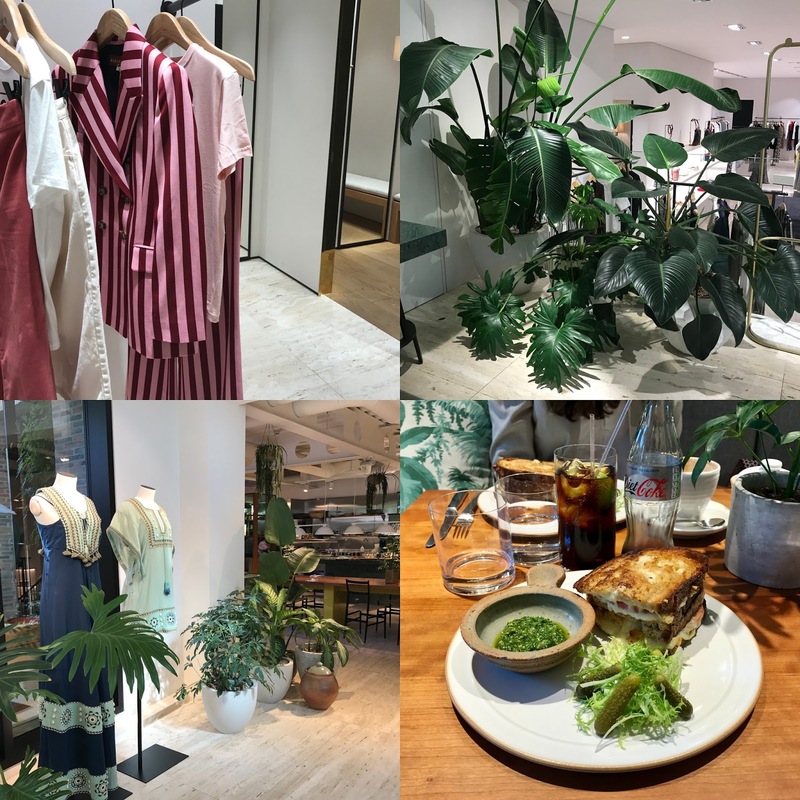 I spent a weekend there in August and went to both old favorites and new discoveries. 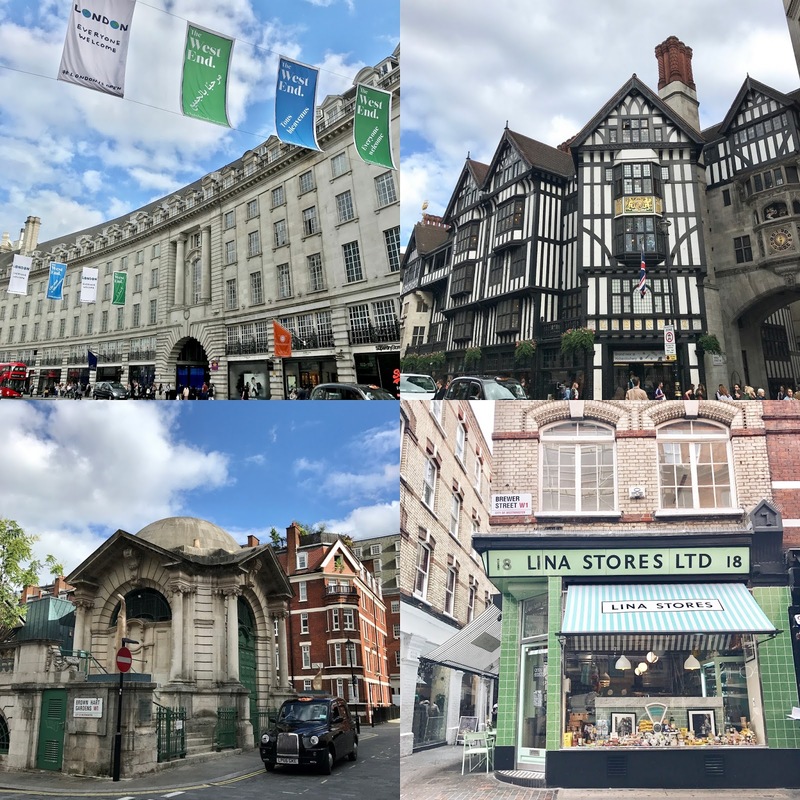 In this post, I'll walk you through my weekend in London, which is bound to give you some good ideas for your next visit. I arrived on Thursday afternoon and picked up the keys to the flat at my friend's office. Gemma lives in Marylebone, which is my favorite area in London, and also where I lived in 2013-2014. It's such a nice area to just stroll around, have something to eat and do some shopping. It's like a complete village! 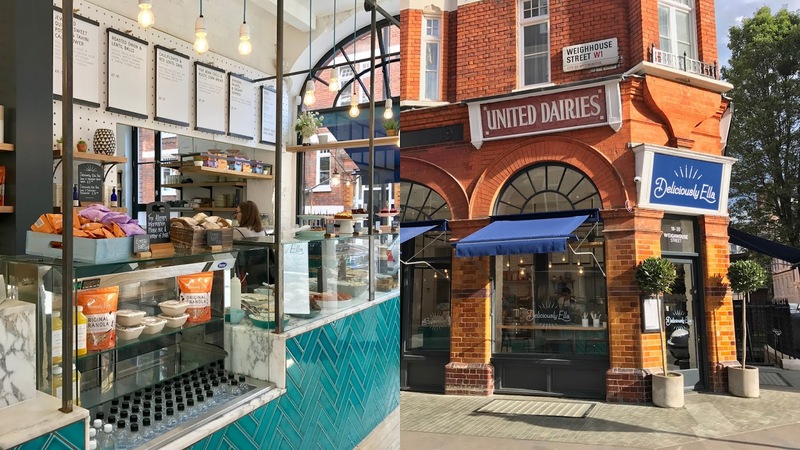 Since I was kinda hungry I stopped at the "new" Mae Deli by Deliciously Ella in Mayfair, which in my opinion is much nicer than the first one in Marble Arch. I love Ella's cookbooks, so naturally, everything they have at this café is my taste. I got a tasty and filling peanut butter shake! 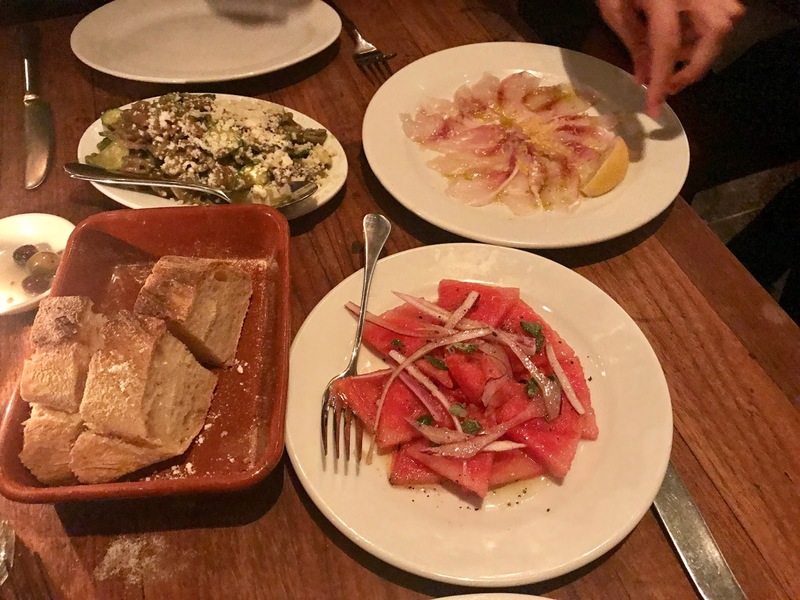 After strolling around for a couple hours and catching up, we went for a very late dinner at Bocca Di Lupo. It's one of my old favorites. Simple Italian dishes, perfect for sharing and a nice atmosphere. The food is absolutely delicious! If you don't dine too late and you still have room for dessert, go for a Gelupo gelato across the street (probably the best gelato in London). I always try to visit a couple of museums in London, depending on which exhibitions they are showing. I wanted to see Giacometti at the Tate Modern, so that was my museum of choice. I actually hadn't seen the "new" part by Herzog & De Meuron so I was glad to see it. Make sure to take the elevator all the way to the top in the new building, for a pretty good view of the Thames, the Millennium Bridge and St. Pauls Cathedral. 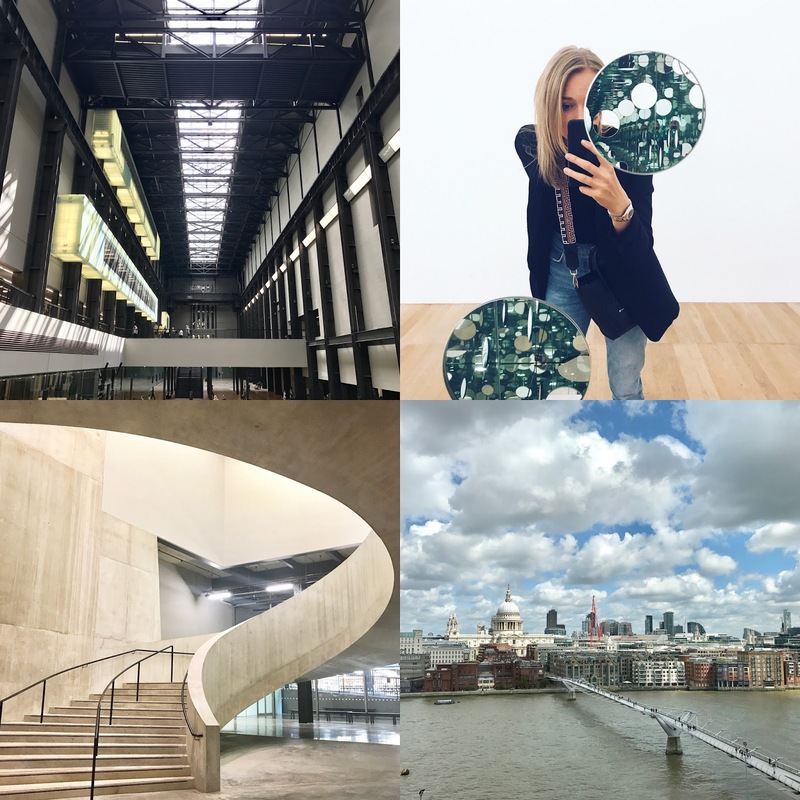 Museum visits always make me hungry, but luckily the Tate is just a 5-minute walk away from Borough Market AKA food heaven. This time I decided to skip Kappacasein's amazing grilled cheese (the best in the world) and join the queue at Padella. We waited 40 minutes but it was SO worth it. 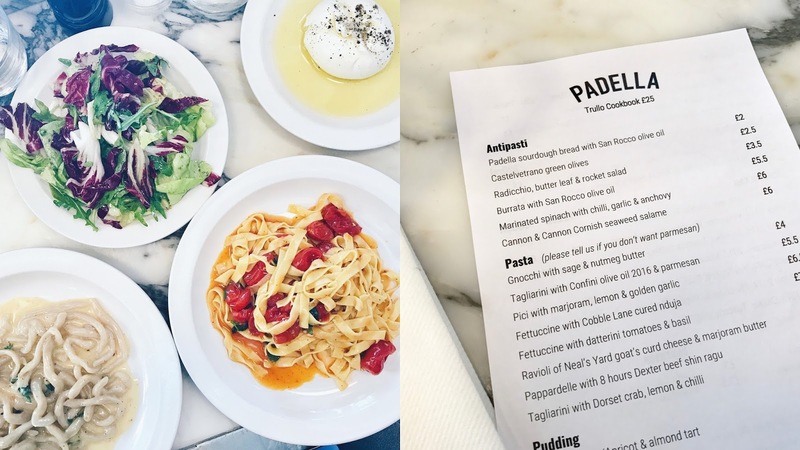 Padella has some of London's best fresh pasta and other little Italian delicacies to share, for a small price. Just make sure you go early-ish (we were there around 12.30). 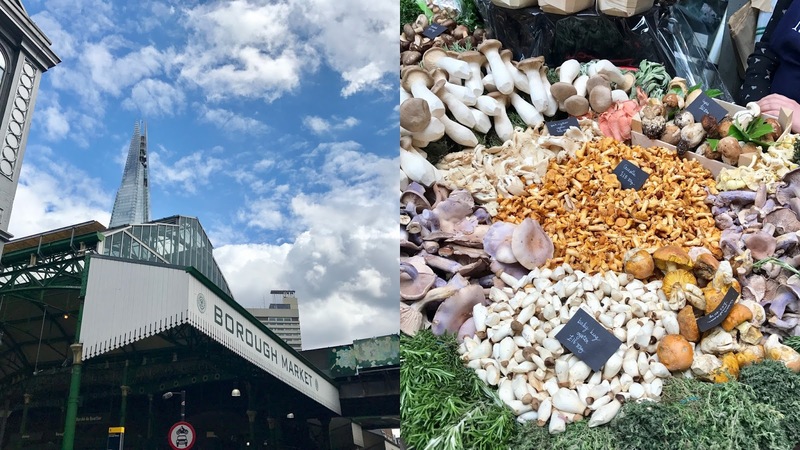 After lunch, make sure to walk around the market and marvel at all the fresh produce (the mushroom stand is my favorite). It can get a little crowded sometimes, but it's still worth checking out! 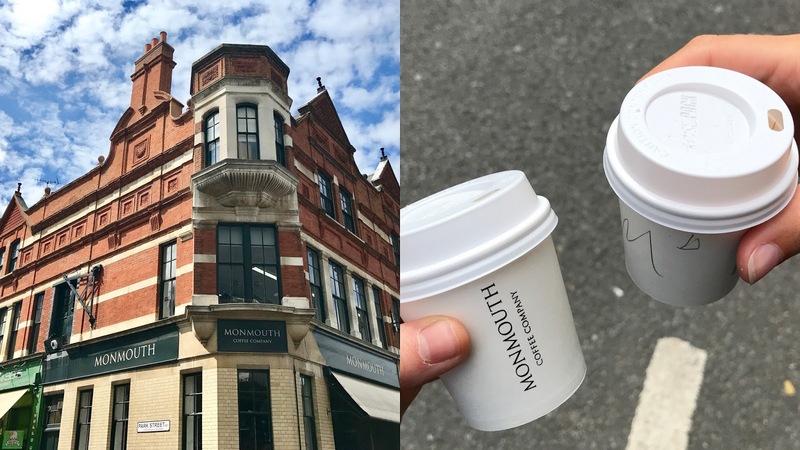 To prevent that post-carb-loaded-lunch dip, we went to get double espressos at Monmouth, which come in the tiniest cups ever. They don't do any milk alternative to cows milk unfortunately (why? ), but it's one of the best coffee places in London so I can forgive them. I love walking around in cities, especially when I haven't been for a while. You always discover new things! 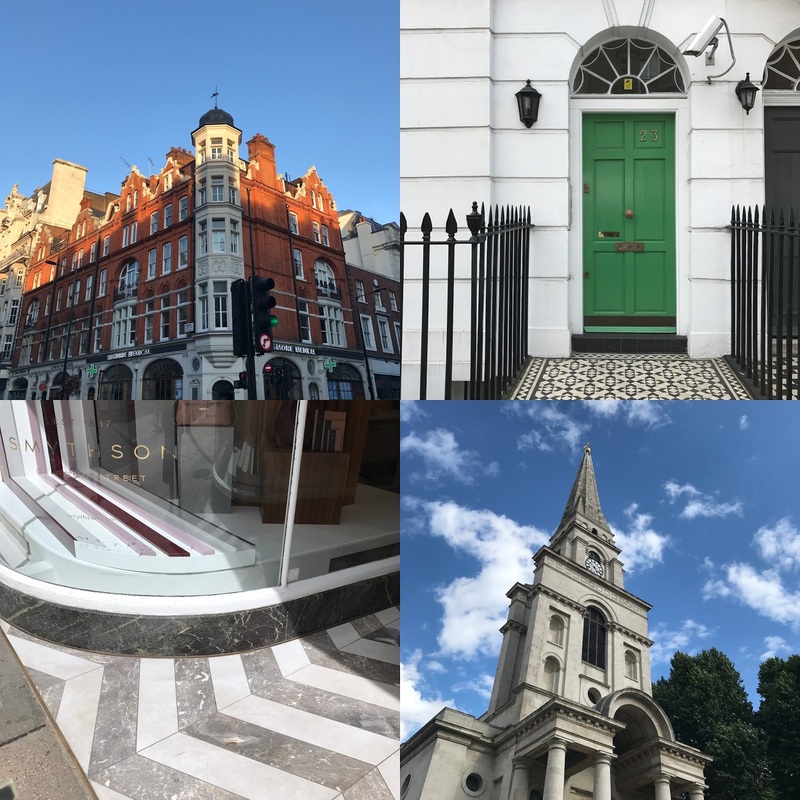 Whenever I go to London, there are some places and areas I always go to: Mayfair, Carnaby Street (+ Liberty), SoHo, Regent Street, Marylebone (Marylebone High Street), Shoreditch (Spitalfields, Columbia Road, Redchurch Street), Notting Hill (Westbourne Grove), Kings Road, South Kensington, New and Old Bond Street, and Primrose Hill. 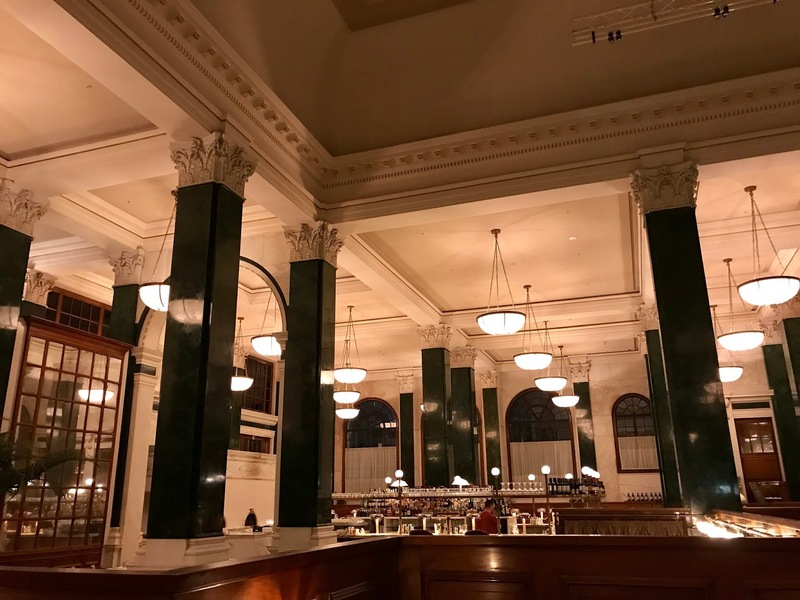 They are, for me, the classic London places. A must, especially if it's your first time in London! 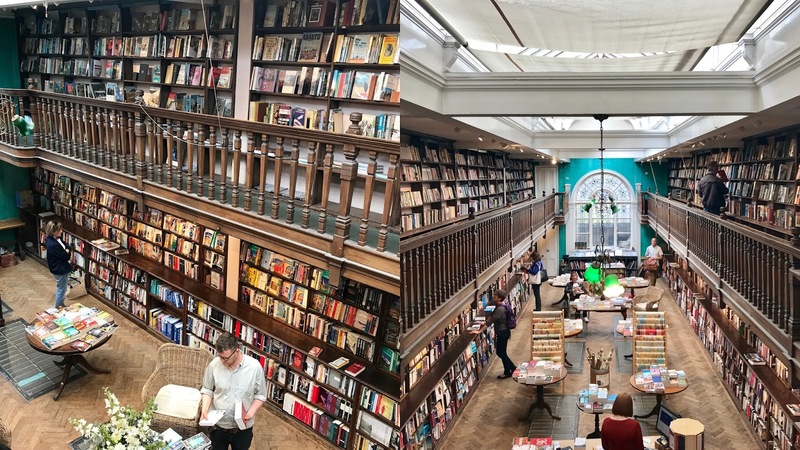 By far the most beautiful old bookshop I know, and I always find some good books here. This time I bought Ready Player One (loved it! ), but I also highly recommend their cookbook selection. Tip: go upstairs to get the best view of the shop! London has many beautiful department stores, but if I had to choose one, it would be Selfridges. They somehow have the best selection of brands, the most helpful staff and a good food department. There's also a (new?) 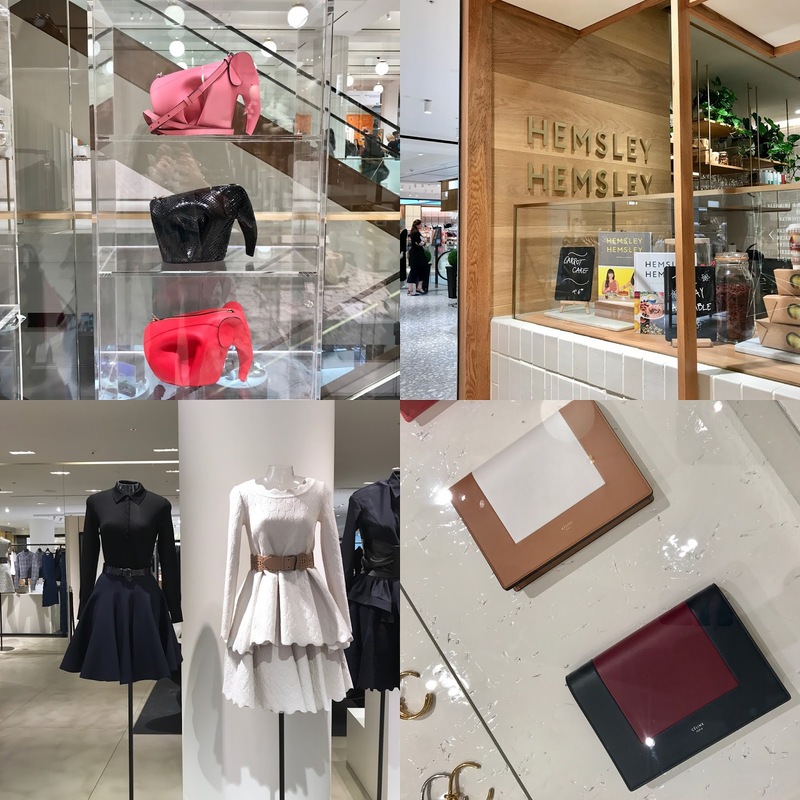 Hemsley + Hemsley café on the third floor, perfect for a nutritious and healthy break while shopping. And if you want to get an excellent blow-dry, cut or color, go to Daniel Galvin on the same floor. It's my favorite salon in London! I couldn't figure out whether this pop-up restaurant is still open, but I believe it is. Ragazzi is a temporary little Italian haven in the midst of Mayfair, created by the brains behind Forza Win (a place I'm desperate to try). Ragazzi is the ultimate girly summer café, serving chilled spritz, paninis and lots of peachy things. If this has closed by the time you've reached London, try Forza Win in Peckham. For dinner, we had more Italian food, which seemed to be the theme of the weekend. Fucina is kind of new in Marylebone. 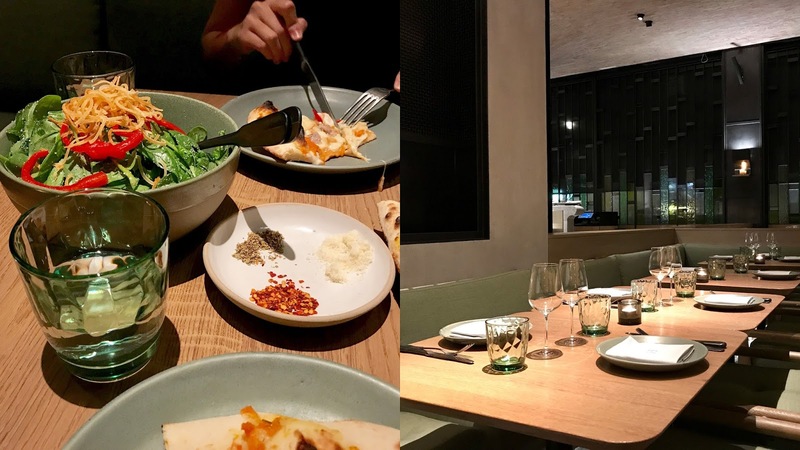 It's high-end Italian food in a really nicely designed space. We came here for dinner but I think lunch would be a better option because the restaurant was pretty empty, and I think it's more pleasant by day. While I wasn't really blown away by the food, the staff was friendly and very well trained. I'd rather come here for lunch or an after-work drink! After a house party in Chelsea, we ended up at the other side of town, in Bank, at The Ned Hotel. 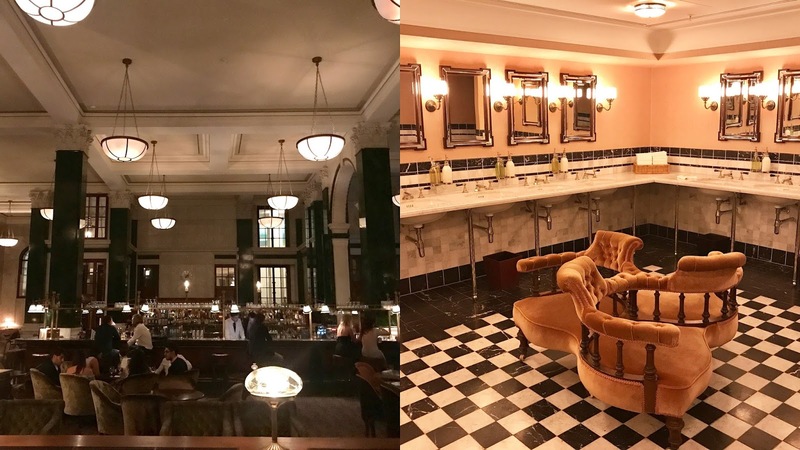 It's the SoHo House group's newest addition, and I was very impressed. They transformed a huge bank into a hotel with 9 restaurants, a bar, swimming pool, gym, spa etc. We went for a drink at the bar downstairs, which is inside a vault, really cool. I sadly didn't go here by day and didn't get to try any of the restaurants, so I'll have to go back! 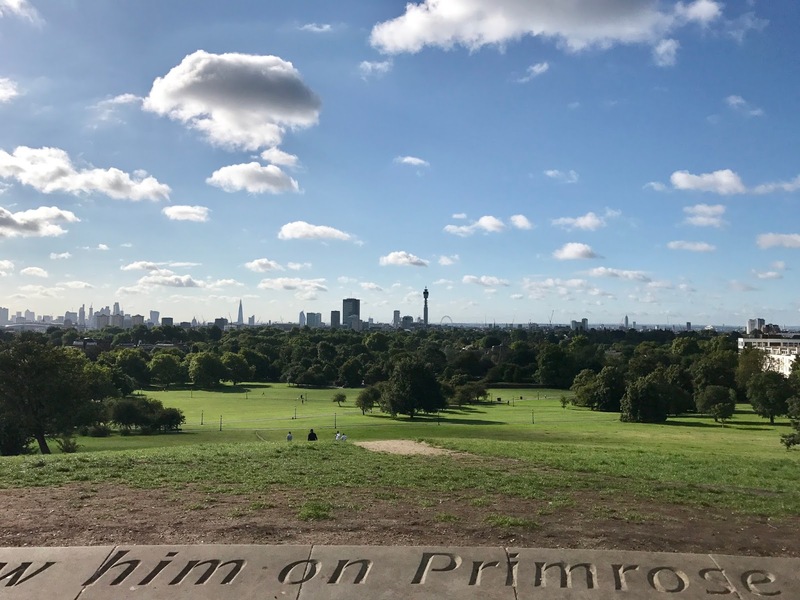 A must for me is going for a run through Regents Park and then up to Primrose Hill. It's a good workout and the view is unbeatable. 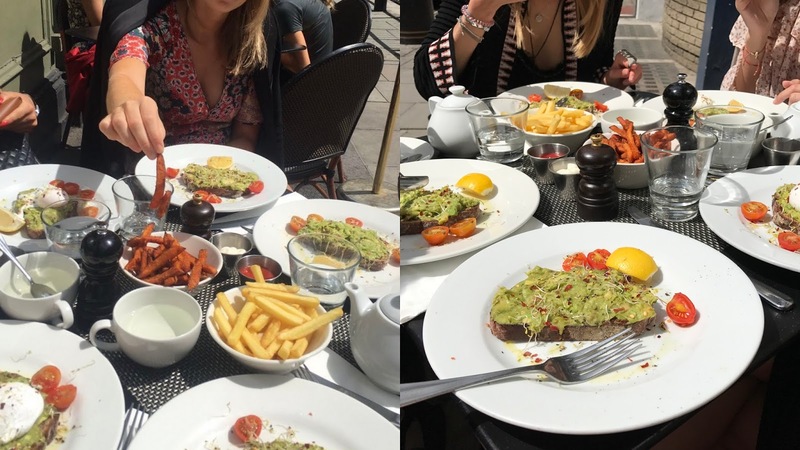 On Saturday, Gemma and I met two other friends for brunch at Timmy Green. Victoria has undergone somewhat of a transformation, which means there are lots of nice new restaurants and cafés, one of which is Timmy. It's Daisy Green's brother, so also run by Australians. And by now you know that Australians make the best brunches, and this was no exception. I shared the avocado toast and coconut pancakes, which were both delicious. I had a bite of the banana bread which was incredible. The coffee is great too, so overall a winner. 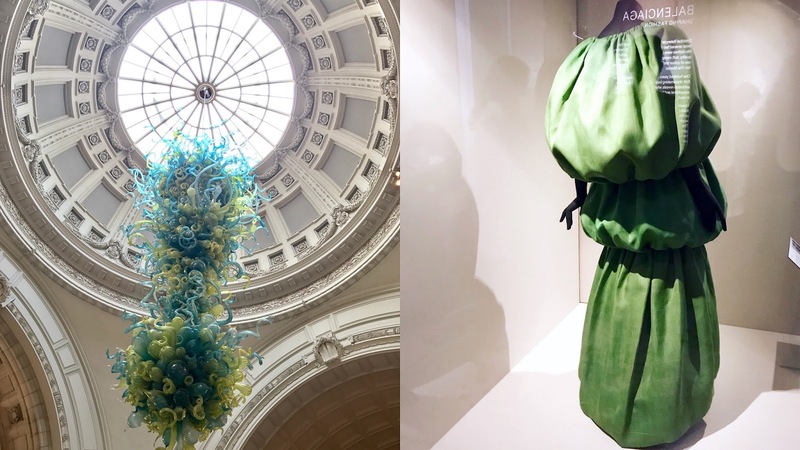 Another museum that was on my to-do list, partly because I wanted to see the Balenciaga exhibition and partly because it's one of London's most beautiful museums. I could spend hours wandering around here. Most London museums have free entry, but you need to pay for exhibitions. Same goes at the V&A. So there's really no reason why you shouldn't pay a visit! I like this area for future house hunting (or dreaming) and just strolling around. 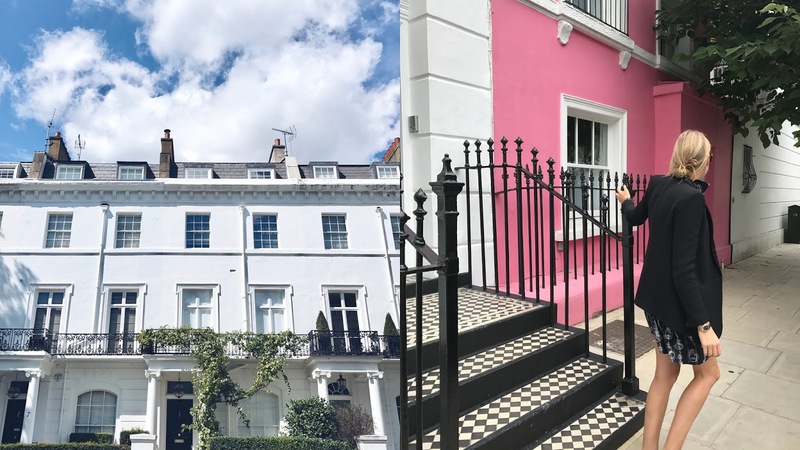 You'll find the most beautiful homes and if you wander around King's Road you'll find some pops of bright colored houses! Don't forget to check out the Saturday Market near the Saatchi Gallery. For me, this is one of London's coolest most iconic buildings, which used to be a Michelin tire depot but now houses an excellent restaurant (with a newly appointed chef!). It's a must-see if you're in the South Ken area. Right next to the Michelin building there's one of the best interior/gift/design shops, namely the Conran Shop. I actually like the one in Marylebone better, but this one is a little bigger. 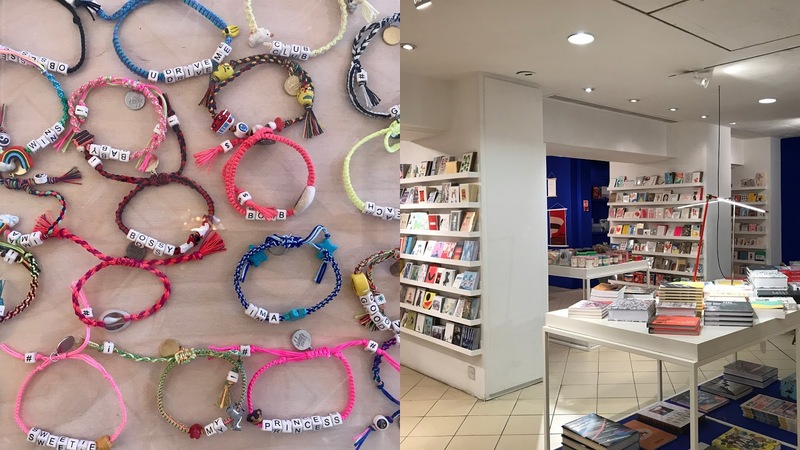 It's the perfect place for browsing or finding gifts! I'd seen some pictures of this café on Instagram so we planned to go for a late lunch, but it seemed to be impossible to find. Until we realized that it was inside Boutique 1, a gorgeous concept store from the Emirates. April's is like a jungle, with plants everywhere (including a mini jungle outside) and printed cushions. We had some very tasty grilled sandwiches here! Afterwards, we browsed through the incredible selection of brands in the boutique. It's the perfect combo! Petersham Nurseries is a plant nursery in Richmond, which also houses a one-star Michelin restaurant. 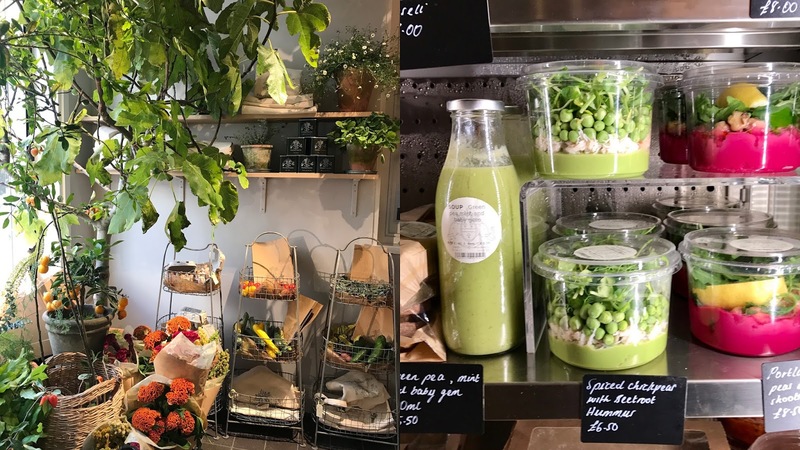 They recently opened up both a flower shop and a deli in Covent Garden, so you no longer need to trek to Richmond to get your daily dose of greens. The flower/gardening/plant shop is like a Walhalla for plant-lovers. 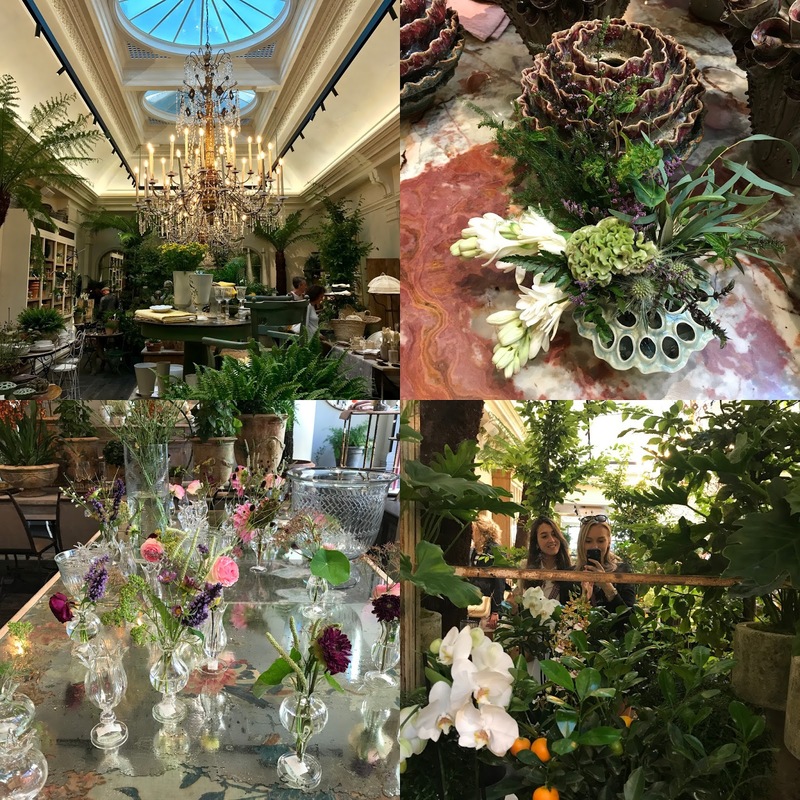 They have beautiful vases, cut flowers, and even tree ferns! The little deli next door has more flowers and freshly made food, which looked exquisite. 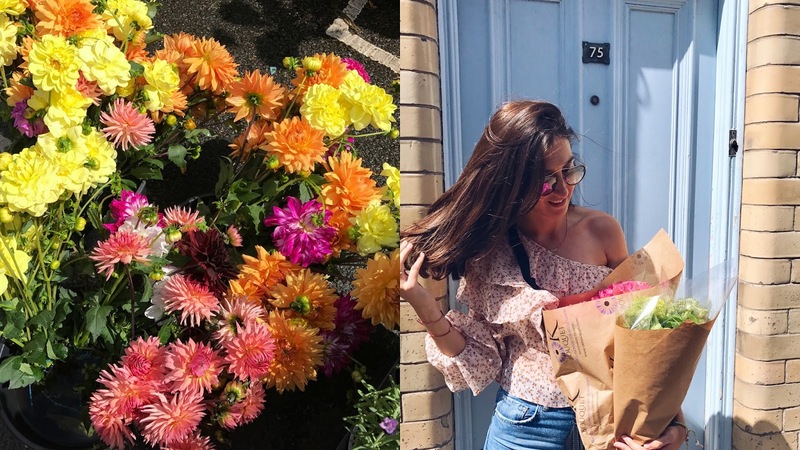 Talking about flowers, my favorite Sunday activity in London was and still is: Columbia Road flower market. It's the best flower market I know, and unlike flower shops in London, you can actually get a couple of bunches for less than a tenner. The atmosphere is always so great here, which doesn't surprise me because who doesn't get super happy when they see an endless sea of flowers? 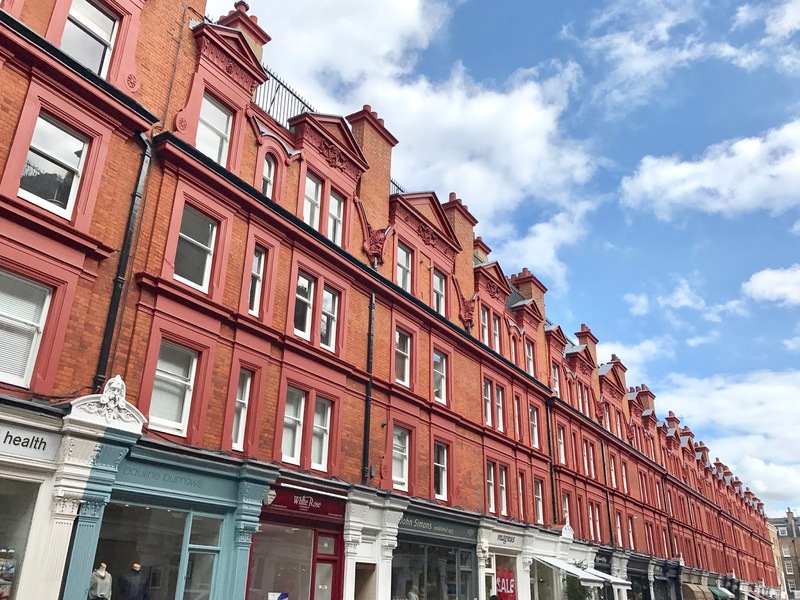 After the flower market, you can wander around Shoreditch, Redchurch Street in particular. It has all of the greatest design shops, cafés and restaurants. 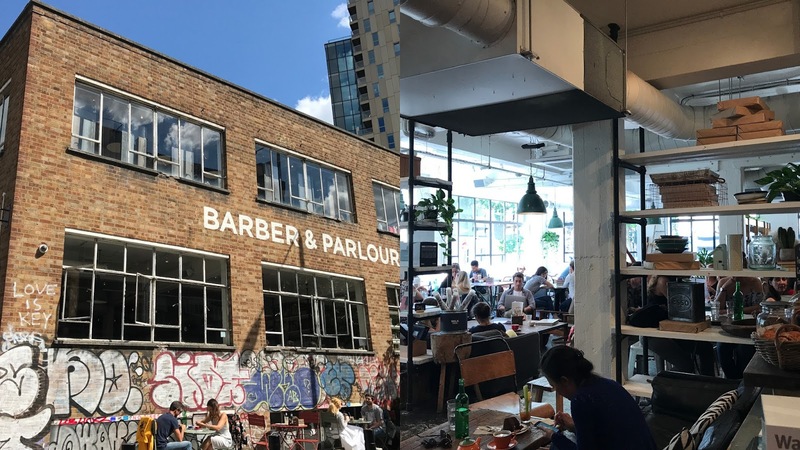 One of them is Barber & Parlour, which is a big lofty space with a barber (duh), a nail salon, café/restaurant and an Electric Cinema. You could essentially spend an entire day here. We sat down for lunch at this cute spot, which had very appealing outdoor seating. 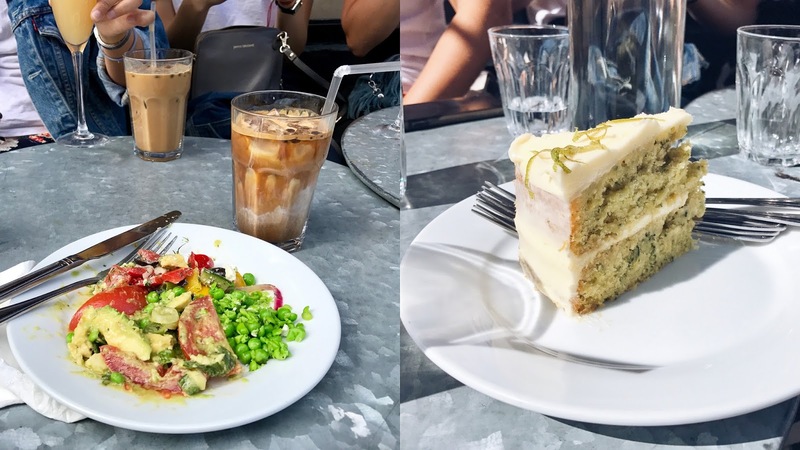 We had iced lattes, build-your-own-salad and the best zucchini cake I've ever eaten (also the first, but I don't think there's any better). All the cakes are to die for, so it's perfect for an afternoon snack! 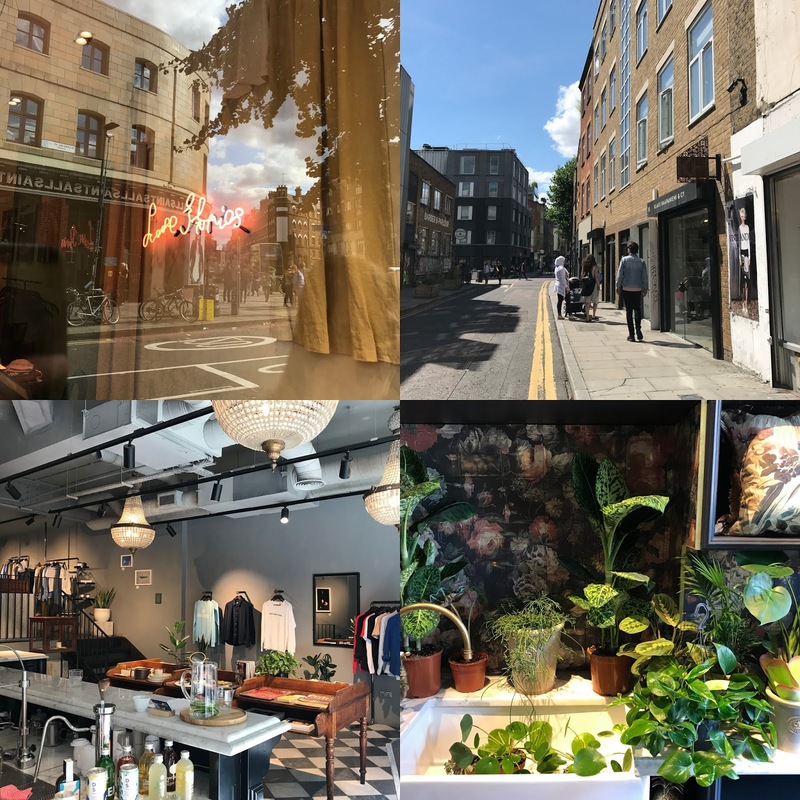 While there's an endless amount of shops in Shoreditch, there are a couple I like to go back to. First one is House of Hackney, who started the whole palm leaf wallpaper trend way way back. I also like checking out Love Stories, even though we have it in Antwerp. Redchurch Street, as I mentioned, has some amazing shops. Some of the best ones: Modern Society, Aimé, Aesop, Monologue, Labour & Wait, and APC. 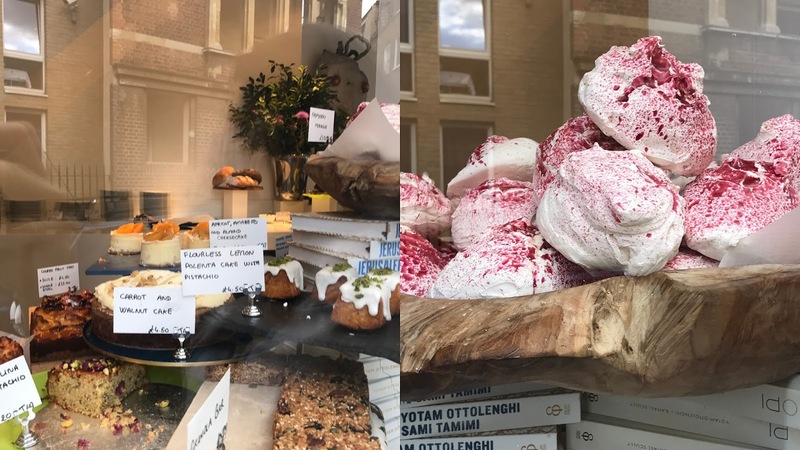 Ottolenghi is a London institution, and no trip is complete without a visit, or a least a little snoop inside. It will be hard to resist all the cakes and pastries on display! 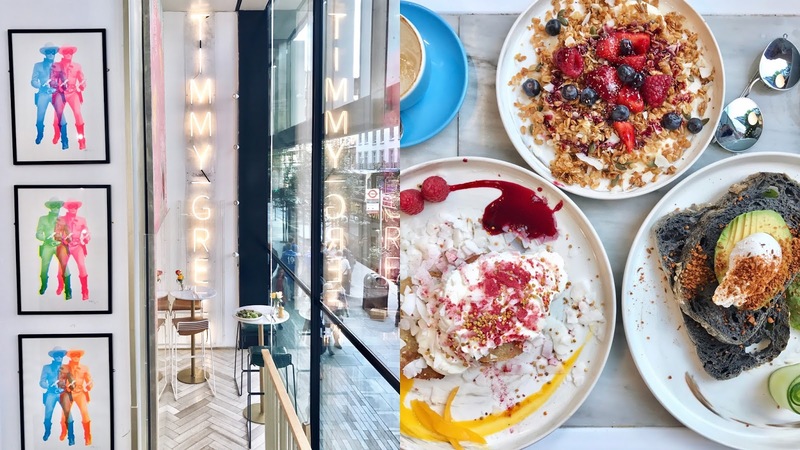 Although there are several Ottolenghi cafés in London, I like to mention this one because it's the biggest one of them all, so waiting times are unlikely. 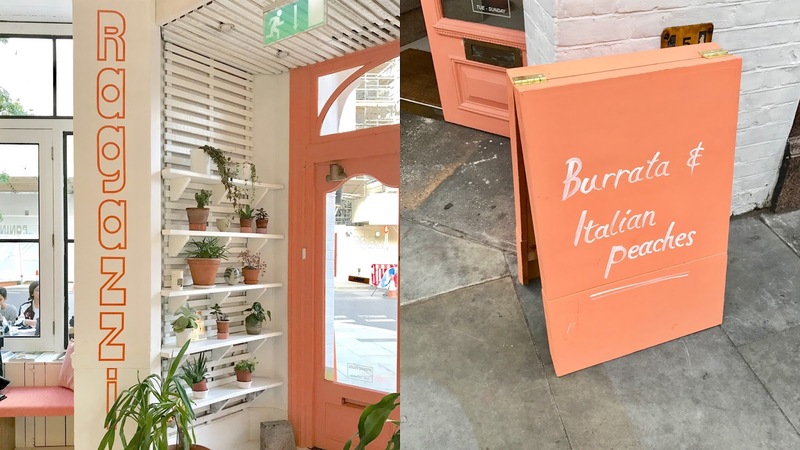 I love all of the salads and vegetables, it's truly one of London's best vegetarian restaurants, although they also cater to meat- and fish eaters. 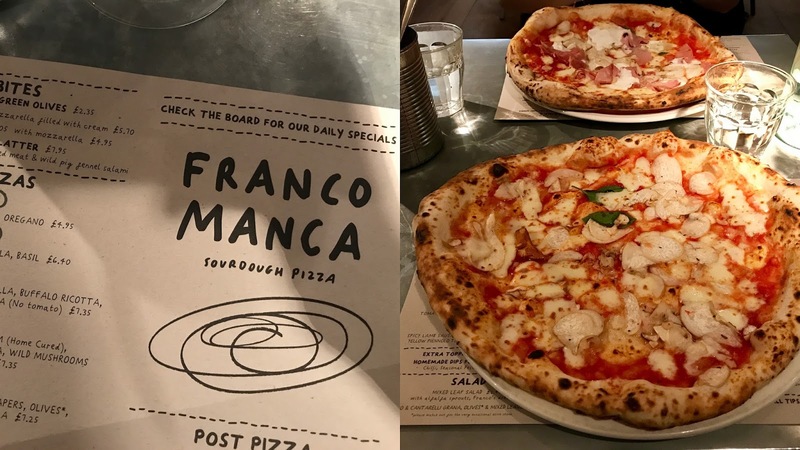 Although it's known as one of London's best pizza places, this was my first time at Franco Manca. They use sourdough as a base which makes a very chewy and delicious crust. Very good pizza, inexpensive and located all across London. Good for a casual and quick dinner. For my last breakfast in London I went to Daylesford early in the morning. Gemma had left for work so I was all by myself! 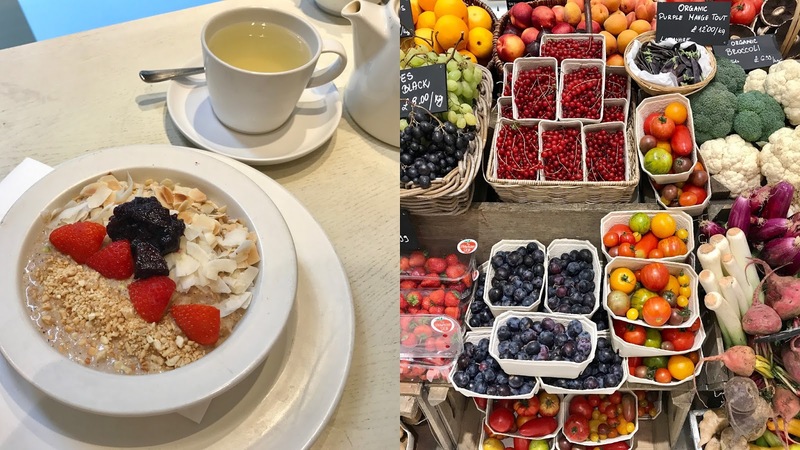 I had a really delicious porridge with berries and prune compote. Only the British can make such amazing porridge! There's a little deli next to the restaurant where you can get fresh food to take away. My Eurostar back to Brussels was late in the afternoon, so after spending the morning walking around I headed to King's Cross and had my last meal at my number one Aussie brunch spot. 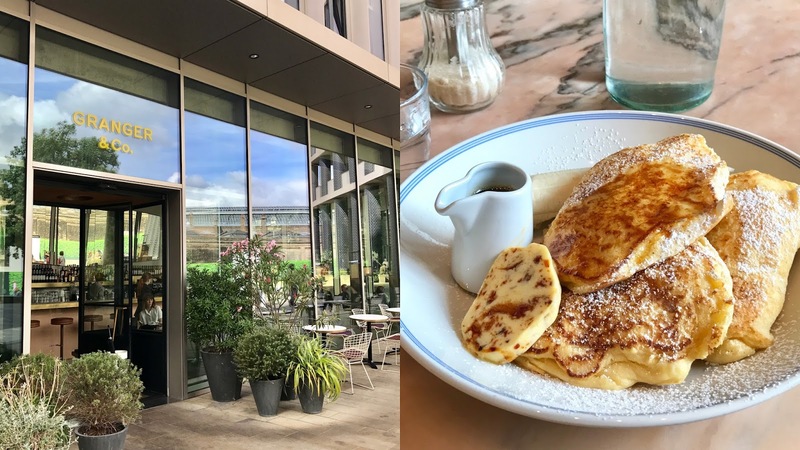 I always order the ricotta hotcakes here, because they are the best pancakes in the world (and I've tried a few). It's so nice that this Granger & Co. is right next to St. Pancras station! Perfect for a last meal before going back home. So this was pretty much my weekend in London! I hope this gives you some inspiration for your next trip! I can recommend all of these places (and left out a couple that I didn't like so much). Until next time London!